In this 200th Feedback Loop post, I’d like to share budget slides I presented earlier this month during the open session of our National Advisory General Medical Sciences Council meeting. The session also included updates on several of our initiatives as well concept clearances for two new ones, which are briefly described in the meeting summary. As part of my acting director’s report, I presented our Fiscal Year 2012 funding plan and focused specifically on our budget for research project grants (RPGs), which includes mostly R01s. The figures below are based on a budget estimate for Fiscal Year 2012, which begins on October 1. Since NIH has not yet received an appropriation for the next fiscal year, the estimate assumes that the budget will be at approximately the Fiscal Year 2011 level. 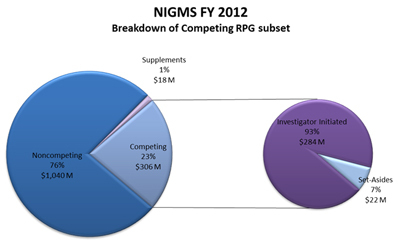 Figure 1 breaks down the total NIGMS budget of about $2.034 billion into its major components and shows that 67% of the budget will support RPGs. Of that portion, we will use around 76% to pay noncompeting grants (commitments on grants already awarded). This leaves about 23% for competing grants and 1% for supplements. Figure 1. 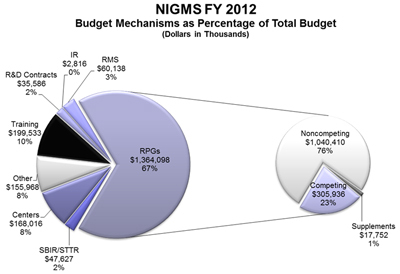 Fiscal Year 2012 breakdown of the estimated NIGMS budget into its major components. About 67% of the budget will support research project grants (RPGs), and of that, 76% will be used to pay noncompeting grants, 23% to pay competing grants and 1% to pay supplements. Figure 2 breaks down the competing RPG budget. It shows that 93% will be used to pay investigator-initiated research and that the remaining 7% will fund mainly R01 grants submitted in response to requests for applications (RFAs), which have been carefully considered by NIGMS staff in consultation with the scientific community and have been approved by our Advisory Council during the concept clearance process. Figure 2. Fiscal Year 2012 breakdown of the estimated competing RPG budget. About 93% of the budget will be used to pay investigator-initiated research, and the remainder will fund R01 grants submitted in response to RFAs. The final figure shows that the portion of the competing RPG budget spent on investigator-initiated research during the last 8 years has varied between 87% and 94%, further indicating that NIGMS commits a relatively small amount of RPG funds to grants that are not investigator-initiated. Figure 3. 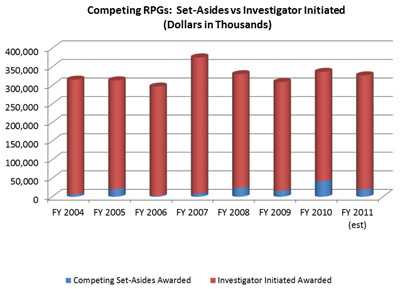 Comparison of RPG budgets in Fiscal Years 2004-2011 for investigator-initiated research versus set-asides for grants in response to specific RFAs. During this period, the portion spent on investigator-initiated research has varied between 87% and 94%. Do unexpected results from your NIGMS-funded R01 or R37 project have you thinking about your research in a different way, or is there a new approach that will greatly advance the aims of your studies? Will you need a collaborator with appropriate expertise to proceed? If you answered “yes” to these questions, you might consider applying for an administrative supplement for collaborative science (SCS). Now in its 4th year, the SCS program enables new collaborations that were not initially planned and therefore are not supported by the parent grant. Grants must be actively funded through at least July 31, 2013, to be eligible for the next submission deadline of January 15, 2012. To be sure that your proposal is appropriate for this program, please read the NIH Guide notice, review the program description (no longer available) and discuss your plans with your NIGMS program director. For general questions about the program, e-mail me or Marion Zatz. In addition to their systems-level studies of complex biological phenomena, the NIGMS-supported National Centers for Systems Biology engage in a variety of training and outreach activities. One recent example is a curriculum for first-year graduate students created by the New York Center for Systems Biology. This material introduces computational principles and approaches that are becoming increasingly important across the biomedical sciences. If you would like to know more about this course and/or download materials such as lecture slides or problem sets, please see the Teaching Resources section (no longer available) of the September 13, 20 and 27 issues of Science Signaling. To learn more about the systems biology centers and their offerings, visit the systems biology portal (no longer available). The Lasker Awards recognize major contributions to understanding and treating, curing or preventing disease. The 2011 prizes were announced yesterday, and we’re proud that two former NIGMS grantees, Franz-Ulrich Hartl of the Max Planck Institute of Biochemistry and Arthur L. Horwich of the Yale School of Medicine, are being honored with the Basic Medical Research Award . 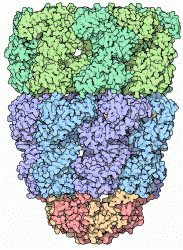 Hartl and Horwich are cited for their discoveries about the cell’s protein-folding machinery, particularly the identification of chaperonin, which shifted the paradigm of how proteins fold. The field of protein folding is a great example of the importance of the basic research that NIGMS funds and how it lays the foundation for medical advances—in this case, shedding light on diseases linked to misfolding or aggregation, such as Alzheimer’s and amyotrophic lateral sclerosis. We’re also delighted that the NIH Clinical Center was selected to receive the Lasker-Bloomberg Public Service Award . The NIGMS program supporting research on the evolution of infectious diseases has merged with the ecology of infectious disease program that has been supported primarily by the National Science Foundation and NIH’s Fogarty International Center to create a new funding opportunity announcement. Ecology and Evolution of Infectious Diseases (EEID) , also sponsored by the U.S. Department of Agriculture, recognizes that infectious disease systems offer a perfect model for studying how context (i.e., ecology) and change (i.e., evolution) interact as organisms adapt to each other. The intersection of ecology and evolution also is relevant to many real-world problems, such as finding new vaccines or understanding how pathogens emerge. EEID research will advance broad, conceptual knowledge that reaches beyond specific systems and that may be useful for understanding public, agricultural or ecosystem health; natural resource use and wildlife management; and/or economic development. The evolution and maintenance of drug resistance. Applications should combine field and laboratory research with mathematical, statistical and computational modeling. We encourage proposals from collaborative teams with expertise from diverse disciplines. Applications are due by December 7 and will be submitted to and reviewed by NSF. NIGMS will consider funding those that score well and are within the Institute’s mission areas. Mentoring is a core value at NIGMS, and we emphasize it in our training, career development and other programs. Among the mentoring activities we encourage in our Strategic Plan for Biomedical and Behavioral Research Training are the use of individual development plans and the adoption of evidence-based practices to grow trainees’ career skills. Another reflection of the importance of mentoring—the Presidential Awards for Excellence in Science, Mathematics, and Engineering Mentoring—recognizes outstanding efforts that enhance the participation and retention of those who might not otherwise have pursued careers in science, technology, engineering and mathematics. A number of scientists and programs we fund have been recognized with past national mentoring awards, including three earlier this year. You now have the opportunity to nominate a great mentor (including yourself) or organization for outstanding and sustained efforts at the K-12, undergraduate or graduate level over at least 5 years. Nominations are due by October 5. See the program solicitation for details .